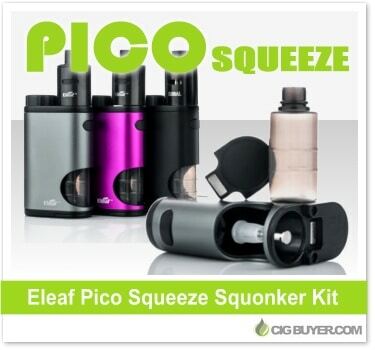 One of only a handful of complete, low cost squonker-style setups on the market, the Eleaf Pico Squeeze Kit includes a newly revised Pico Squeeze Mod with an integrated 6.5ml refillable squonk bottle. Retaining the same compact form factor as the original Pico, the Squeeze is a direct output voltage system powered by a single 18650 battery; with a range of 0.15 to 3.5 ohms and a maximum output of 50W, depending on atomizer resistance. No dripping is necessary, just press the squeeze bottle to force juice into the 22mm Coral Squonk RDA; featuring a 2-post design with dual adjustable airflow.